As crazy as it may sound, Google has not yet “organized the world’s information” about Common Lisp. The best tutorials are hard to find. Here’s how I got started. Author’s note: I started on this post before publishing my previous entry, Questions for Common Lisp Experts, so I am much smarter today about why things work they way they do in Common Lisp. However, I thought it might still be helpful for other newcomers to see how I went about getting started with Common Lisp. Some of the concepts in here feel a little too basic now, but at the time, they were a struggle to get to. In that sense, this is both a tutorial and an experience report. I would still recommend this approach. If you’re used to exploring different modern language environments (i.e. those that got their start in the 21st century), Common Lisp is daunting and unusual in a number of ways. First of all, the term “Common Lisp” refers to a language standard, not a particular compiler or implementation. Since that standard was accepted and published, there have been many implementations created, some proprietary and some open source, and a number of them are in active use. So your first decision point is “which implementation of Common Lisp should I use if I know nothing about this language?” This is where I’ll try to help, starting with the first step. Most guides direct you to a long list of Common Lisp implementations to choose from, each of which has its own configure, make, make install setup to build from source. But you don’t need to build from source if you just want to start learning the darned thing. Fortunately, less than a decade ago, a kind soul developed the Roswell tool, which manages the whole process of fetching, building, and switching between the various Common Lisp implementations that are available via open source. There are a couple of simple ways to install Roswell. Or on ArchLinux, use the yaourt tool. Or a .zip file for Windows. This installs the binary distribution of the latest version of Steel Bank Common Lisp, the version that the cool kids seem to be using these days (more later). But nobody uses the REPL from the command line like this. You want to use an editor with support for an integrated REPL (notice I didn’t say emacs). See Editors. If and when you install another Common Lisp implementation, you will use the ros use command to select it as your default lisp. Roswell can do much more, see the documentation. There are lots of Common Lisp implementations to choose from, some free and some commercial, so why choose SBCL? Because it has a github repository (which is a mirror of its SourceForge repository, but at least the source is there); and it has a monthly release schedule, which means it’s being actively improved. One of the advantages cited by Common Lisp advocates is that there are many compatible implementations of the language standard, which means you can write code and try it out on different compilers. Since some compilers emphasize different things, from type inference to optimization, this can only improve the quality of your code. This is true, but it’s incredibly confusing for newcomers. Just start with SBCL, see if you can get productive, and then shop around for alternatives. There are definitely some interesting projects out there. 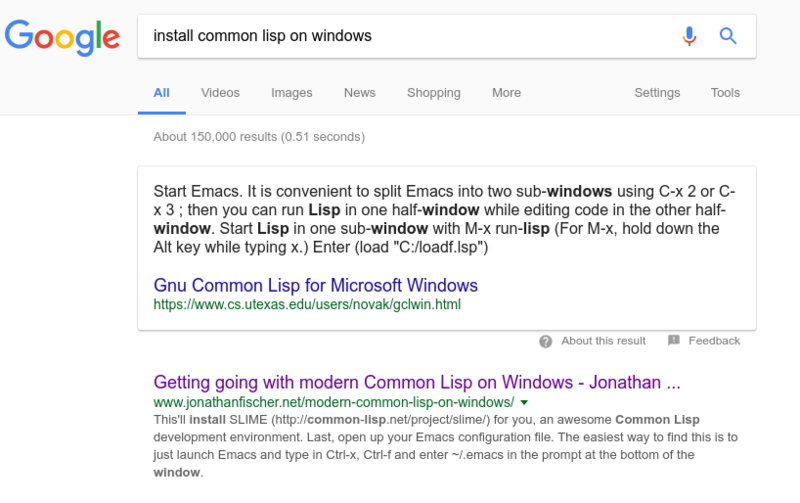 The joke is that everybody wants to try Common Lisp until they hear you have to install emacs in step one. (I.e., see what Google Search recommends, sheesh.) Well, you don’t. The Atom editor is a decent choice and even supplies a plugin to get you closer to the emacs-inspired interactive editing nirvana we all dream about it. Aside from installing the Atom packages atom-slime, language-lisp, and lisp-paredit, you need to get a copy of the SLIME code that emacs uses for its magic. Then, you need to set the atom-slime settings to tell it how to launch SBCL, and where to find the SLIME you downloaded. To repeat, since this is unusual, you need to git clone the SLIME repo and then tell atom-slime where to find it. Since we’re using Roswell, the “Lisp Process (Name of Lisp to run)” setting should simply be ros. The atom-slime developers have helpfully integrated knowledge of Roswell into their system, so there’s no need to do the usual ros -Q run, which is what emacs users have to do. After that, select Slime -> Connect from the Packages menu, wait a few seconds for the initial compilation of SLIME to complete, and you’ll see a REPL pop up. If you think you’re going to manage nested parentheses without the help of a plugin, forget about it. There is no reason to do that, these days. If you’re an emacs user, you know you live for the frustration-followed-by-breakthrough-dopamine-rush of combing through decades-old wikis or info pages to figure out how to set yourself up, right? Or, just install Prelude and customize it from there. Prelude gives a great out-of-the-box experience for new emacs installations. I always start there. For Lisp, here is my personal.el file. You don’t need all of it, but note that 1) it’s not long and 2) The SLIME-specific settings are at the bottom. The main thing is you want to set slime-lisp-implementations. SLIME supports switching between multiple implementations, but we’re using roswell for that, so no need. Prelude comes with most batteries included. It uses a file called prelude-modules.el, which you place in your ~/.emacs.d/ folder, to load language-specific extensions. Unfortunately this file is not installed by default. What you want to do is install it, and then enable the common lisp extensions. Then edit ~/.emacs.d/prelude-modules.el, uncomment the prelude-common-lisp line, and restart emacs. It will download and install the necessary packages emacs needs to get you on your lispy road at startup. If you’re not looking to set up a long-term development environment and just want to give Common Lisp a try, take a look at Portacle. It’s a one-click installer that even works on Windows, that gives you an emacs editor along with a recent version of SBCL. There’s a big fat red warning on its home page, which is why I steered away from it. But the Windows installer does work. You want to npm install but since Common Lisp standardized before npm was even conceived, it’s not quite that simple. There are two tools you need to know about to get libraries: quicklisp and asdf. Don’t google them yet: you’ve already got them, since asdf is bundled with SBCL, and quicklisp is bundled with Roswell. Quicklisp is like clojars or the npm registry. It’s a distribution site for slightly vetted libraries. One of its major drawbacks is that it’s only updated monthly, but in some sense it’s an advantage, because the libraries it includes have generally been stable for years. This approach also encourages library authors to maintain backwards compatibility, which if you agree with Rich Hickey’s complaints about Semantic Versioning, is probably a good thing. to load the most-used, practically mandatory Alexandria library. Quickload will take care of downloading your libraries and loading them into your repl. This is fine if you’re playing with code in the REPL. But what if you want to build a library or application yourself? ASDF loads code from your local disk into a running Lisp image. It’s also the way you configure your libraries for sharing with other projects. The terminology used in Common Lisp was invented in the 18th century, so bear with me here. A package is what we would call a module or a namespace today. Outside Common Lisp, a common approach is to combine loosely-coupled modules together into a program, and to use one file per module. This approach translates to using a single Common Lisp package per file. However, this is not how Common Lisp libraries have been developed, historically. The standard allows for different approaches, so see this StackOverflow question and answer for more background. Personally, I find the use of a single global namespace makes it difficult to separate concerns, even if Common Lisp does not strictly enforce information-hiding. So I tend to stick with the one-file-one-module/namespace/package approach. Next, a system is what we would call a library or an application today. It’s a collection of source files that represent packages, plus additional things like test files, documentation, etc. Systems are defined in .asd files using the defsystem form provided by ASDF. Like most things, including Clojure, Node, etc, getting this file right is a bit of a pain in the neck until you learn it. There is a tool called quickproject designed to help with this. It’s not exactly as easy as the various template-driven get-started-with-a-new-project things out there, but it’ll at least ensure your initial defsystem form is correct, and you can edit it from there. Here is the .asd file from a library project I’m working on. It makes use of ASDF’s package-inferred-system scheme, which I gather is ASDF’s way of supporting the one-file-one-package approach. The main benefit is you don’t have to enumerate your source files, because ASDF finds them in the current directory, and finds transient dependencies by reading your defpackage or define-package form. :name "It's back to the future all over again." In this system, I use the Clojure-esque approach of implementing functionality in separate namespaces (which don’t need to be listed here), and importing/re-exporting them from a core package. Again, the nice thing is I don’t generally have to touch this file when I create new source files. There is probably need for a complete tutorial on how to do this. Apparently the Common Lisp community doesn’t generally explicitly depend on library version numbers. Now, I happen to know for a fact that the whole idea of version numbering existed before Common Lisp was standardized, so I’m not sure what the reasoning here is. I suppose it encourages library writers to always maintain backward compatibility, which is a great thing. But it is confusing for people coming from other library ecosystems. ASDF does support declaring dependencies on external libraries with specific versions. But few projects seem to use that, and it isn’t obviously clear how that would work with Quicklisp. Fortunately, there is a Common Lisp tool called qlot that aims to provide project-local dependency management in the style of npm. For more background on the traditional approach to packages in Common Lisp, including a detailed explanation from Rainer Joswig (who is the single most dedicated and helpful Common Lisp expert publishing regularly), see this Stackoverflow question. Ok, so you’ve installed Roswell, you’ve learned about Quicklisp and ASDF, and your home directory now has a few new . directories. The most important thing to know right now is how to get ASDF to find your source code when you want to load it up. Firstly, if you’ve used ql:quickload to get it, there’s nothing else you have to do. ASDF and Quicklisp work well together. This is mainly about code you’ve written yourself, or code which isn’t available in Quicklisp. If you don’t really care where you put your code, just put it in directories under ~/common-lisp/ in your home directory, and ASDF will find it. When ASDF starts up, it makes a catalog of every .asd file it can find under that home directory. (This means, by the way, that if you add new .asd files or systems, you need to reset ASDF. The simplest way to do that is to restart your REPL, but there are also ASDF commands. Unfortunately, I always forget which command is which, and restarting the REPL takes about a half-second, so that’s what I do. This file tells ASDF to look for code under my ~/dev/common-lisp directory, because I like to pretend there are non-dev things I might use my computer for. The .roswell directory has a pretty complex organizational system, because it needs to manage multiple Common Lisp implementations (and versions of them) as well as Quicklisp. So you might have to hunt around in there. Some guides tell you to use local-projects in the Quicklisp directory. If you put symlinks to your projects in that directory, Quicklisp will “load” them from there instead of the Internet. I don’t use that, but apparently there use to be something called “symlink farming” which apparently was quite popular. For other great beginner resources, see the sidebar on /r/lisp. There is no better learning resource about the language, as opposed to the development environment, than Practical Common Lisp. Quickdocs is the place to go to browse through the libraries available in Quicklisp. It’s also a handy way to see who depends on which libraries, which can be a proxy for stability and reliability. A good curated list of libraries to reach for is the 2015 State of the Common Lisp Ecosystem report. Another (a bit less curated) is Awesome Common Lisp. The definitive (well, almost) ANSI Common Lisp spec is available online at something called the HyperSpec. It may make your eyes bleed because it was typeset in the 90s and has an overly restrictive license that prohibits anyone else from improving it. (Why, oh why? Someone should write a letter). There is no better comprehensive resource online, unfortunately, and once you get used to every other word being an underlined hyperlink (wow, if you use your pointing device and click the word, it takes you to another page! ), it can be quite helpful to understand the finer points of Common Lisp. If you can’t read the website because of eye damage, keep trying. Amazingly, after a few weeks of repeated exposure, I can now actually read it. On the other hand, the Common Lisp Quick Reference is a beautiful document, lovingly crafted, and designed to be printed by one of those machines that puts ink on paper. Ok, so the “quick reference” is 53 half-pages including a comprehensive index, but this is Common Lisp we’re talking about! Seriously, though, this is really an excellent reference. Print it out, put it in your laptop sleeve, read it on the train, bus, plane, wherever. You won’t regret it. Common Lisp, like all Lisps, rewards those who invest the time to learn. I hope this little guide helps at least one person save a little time with the boring stuff so they can get to the good stuff. Comments are always welcome and are on reddit. I left out the Common Lisp Cookbook, because I hadn’t run across it in my initial setup exploration. For a video guide to installing Emacs and SBCL on Windows, see this video from Baggers, who also live-streams his coding sessions regularly.